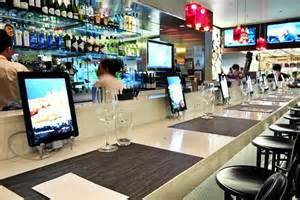 Why are restaurants utilizing tablets? Compared to the smart phone, the tablet is a better choice primarily because of its wider screen. With a bigger display, people are better able to see images and read text or descriptions of dishes being offered. Other than displaying content on menus, however, the tablet also has other uses in the restaurant business. Getting orders from customers is now a breeze with the tablet. As an example, a person ordering food can simply tap a button for a particular dish he or she wants to order and the staff at the kitchen will immediately be notified about it. This functionality would no longer require a waiter to write down the order. He or she only has to wait for the customers to finish making their order via the tablet and makes sure the kitchen staff received everything. Tablets can also be effectively used as a point of sale (POS) device. It can process credit card payments and issue receipts right in front of the customer. So when a tablet is provided for each table, for instance, it would be easy for people to pay for their orders without having to ask the waiter to get their bill from the cashier. No more long waiting in this scenario. Again with this functionality, customers experience the most convenience while dining in a restaurant or food chain. Right there at their table, they can pay for their bill any time they want. Business owners can even take advantage of this by offering coupons during the payment process to loyal customers. They can include the coupon in the receipt that’s issued by the tablet. Still another advantage of using tablets is the ability to monitor customer feedback and behavior. With the analytics tool installed in the device, business owners can keep track of their customer satisfaction levels and they can even ask for feedback regarding their service during the payment process such as through a short survey. Some restaurants across the world are now using iPads to show their wine lists. Stupid and overkill, you say? Not if you sell a lot more wine because of it. Everyone using iPad wine lists seem to be having big sales jumps. It’s not the novelty factor, the restaurant owners and clients say. The reason is simple and logical: Reviews. Most people don’t know most vinos in a restaurant wine list. They may know that certain region and certain winery and certain grape and certain year are considered to be good or bad or just nice enough. But with so many references, most mortals don’t have a single clue. Now, if you had instant access to a short review for each wine from a credible source, then you can make a decision on the spot. So when Robert Parker says that a 1995 Pingus is “one of the greatest and most exciting wines I have ever tasted”, then you may decide that it’s well worth the price tag. iPad wine list app for restaurants offers a new and exciting way to display your wine and beverage menus. 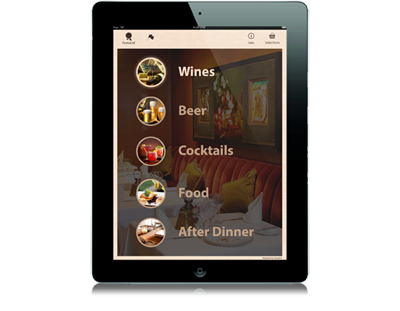 Pass out an electronic menu to your guests on tablets and deliver a fun and interactive experience while increasing your restaurant sales. Tablet menus work for wine, beer, spirits, cocktails, food and any other restaurant items.